The T-shape is ideal for larger properties with a long wall on which to build the conservatory. 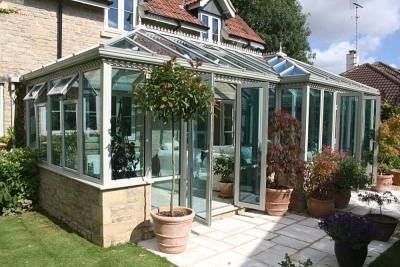 A T-shape conservatory allows for maximisation of space and gives an attractive symmetrical appearance. A central projection highlights the shape and can create a ‘porch’ effect to the conservatory if this is where the doors are placed. Since the 17th century architecture in buildings has changed dramatically. Architects with their individual flair and creativeness were always looking for new ideas and challenges. What they realised was even the most ordinary looking building had its own individual characteristics and these could be reflected in the design of the conservatory. Today conservatories can be tailor-made to match individual tastes and requirements no matter how complex the site, making the customised conservatory a popular choice. The completed project should be complementary to the home and care is taken to make the conservatory appear as though part of the original host building design.